I planted a large bed this summer with decorative annuals in the spring. Within a few weeks a plant began to grow in the bed that was not what I planted. Curious, I let it grow. It grew quickly and developed very large (12 inch or more in diameter) leaves and stalks that were 1. 5 inches or so in diameter. The leaves and stalks had hairs on them. Finally, a bright yellow flower developed and web searches lead me to believe it was a pumpkin plant as the flower was about 5 inches in diameter and had 5 distinctive pointy petals. Now I have fruit. 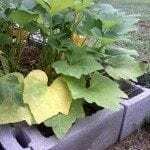 It resembles a delicata squash; however, a neighbor thought it could be a gourd. How can I most easily determine if it is a squash or a gourd?